The location of knee pain can help identify the problem. 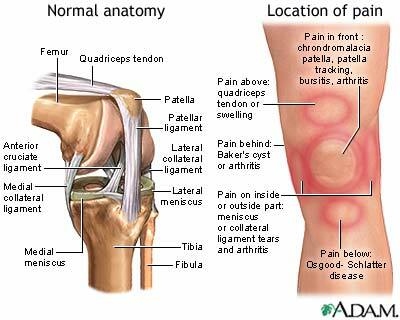 Pain on the front of the knee can be due to bursitis, arthritis, or softening of the patella cartilage as in chondromalacia patella. Pain on the sides of the knee is commonly related to injuries to the collateral ligaments, arthritis, or tears to the meniscuses. Pain in the back of the knee can be caused by arthritis or cysts, known as Baker’s cysts. Baker’s cysts are an accumulation of joint fluid (synovial fluid) that forms behind the knee. Overall knee pain can be due to bursitis, arthritis, tears in the ligaments, osteoarthritis of the joint, or infection. Instability, or giving way, is also another common knee problem. Instability is usually associated with damage or problems with the meniscuses, collateral ligaments, or patella tracking.